Thursday was an exciting day for us and for a 28 year old bald eagle, rehabilitated at REGI and released back to his home territory near Ladysmith, WI. According to DNR records at age 28 that makes him the oldest known bald eagle in the wild in our state. There may be others older of course, but the only way we know if is they are admitted to rehabilitation or the band is ready in some other way so we can get the data from it. This bird came in last May. He is in bad shape. He has been shot with a shotgun. The shooting broke his left leg. If that was not enough he has electrical shock injuries. Either injury would have been serious, even fatal if not rescued by Chris Cold, DNR biologist and educator. We often see multiple problems in our patients. Once they are injured they are compromised. They are weaker and not flying as well or as exact as they would in a normal circumstance. The eagle recovered well. I have to say that he exceeded my initial prognosis for him. Everything went perfectly for him while in rehabilitation. The leg healed very well and he has 100% use of the leg and foot. That is important stuff if you are an eagle and you rely on your feet and talons to feed not only yourself but your mate and family! The biologists in the area wanted to wait until the harsh part of winter was over before he was released back to the wild. Thursday the day had come. While lakes in the northland are still covered with thick layer of ice some of the flowages and moving water is open. We drove him to Ladysmith for release early on Thursday morning. He was not at all happy being caught up once again and being force fed once again. 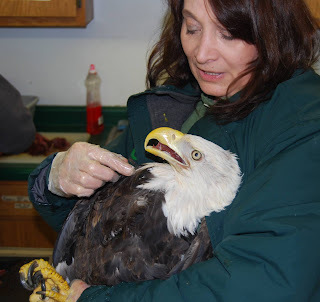 These things happened when he was in critical care but for months he was in the large flight building exercising and socializing with other bald eagles. Once we arrived at Ladysmith I took him from the carrier and held him for the last 2 miles of transit in the front seat of the car. He was STUNNED! The look in his eyes as he looked around and recognized the area and the landmarks he had known for the past 27 years or so sent chills down my spine. He just stared as if he could not believe his good fortune. The release went quickly. He didn't give photographers much chance for those spectacular flying away shots, but he is home and that is what matters. People keep asking if we name the birds in our care. We do not. I feel strongly that giving the birds that are going to be released back into the wild indicates they belong to us. Nothing could be further from the truth. They are here for a short time and then it is back to their life as they knew it. We are but a bump in their road. We hope this eagle has many more years in the wild. Bald eagles can live to be over fifty years in captivity, but in the wild there are many things that work against them. Things like illegal shootings, lead poisoning and other toxins all obstacles that are human oriented make their life more challenging. We hope his time with us at REGI will soon be but a vague memory for him as he reclaims his life in the wild. Thanks to the WI DNRs Chris Cold and to Ron Eckstein that banded this eagle so many years ago. Without that band we would never have known his age or his story. Awesome!! Congratulations again Marge and thank you so much for your dedication to our wild feathered friends.